Nacho Supreme — Homemade Tortilla chips, Greek sauce, jalapenos’, sour cream, salsa and nacho cheese. Garbage Fries — Fresh-cut or waffle fries served with Greek sauce, nacho cheese, diced onion & jalapenos’. 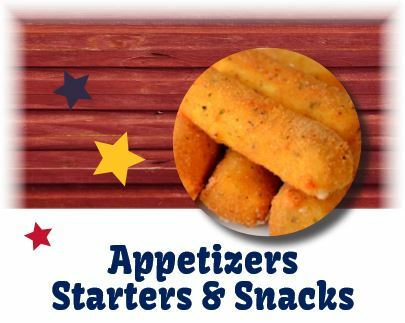 Cheese Sticks — Five sticks, deep fried and served with your choice of ranch dressing or marinara sauce. Vegetable Flatbread — Flatbread with garlic butter sauce topped with spinach leaves, tomato, onion, black olives and cheese. Pepperoni Flatbread — Willie’s version of a traditional pepperoni pizza with our own in-house marinara. Chicken Bacon Ranch Flatbread –Our signature flatbread topped with ranch dressing, grilled or crispy chicken, bacon and a blend of mozzarella and provolone cheese then baked to perfection. Chicken Tenders — 4 All breast-meat tenders deep fried and served with your choice of dipping sauce. Bavarian Pretzel Sticks — 4 sticks served with your choice of dipping sauce. Fries — A large porton of fresh-cut or waffle fries. BUILD-YOUR-OWN APPETIZER BASKET — A perfect start to any meal. You choose any combination of 4 of the following items: cheese sticks, jalapeno peppers, onion rings, zucchini fries, fried green beans, fried mushrooms, battered pickles, fresh cut fries or waffle fries. Service with ranch or marinara. Choose all the same or all different…YOU BUILD IT!